At left, Julie Cirella, 8, in an undated photo. At right, where Julie was found dead at a house in Plainview. 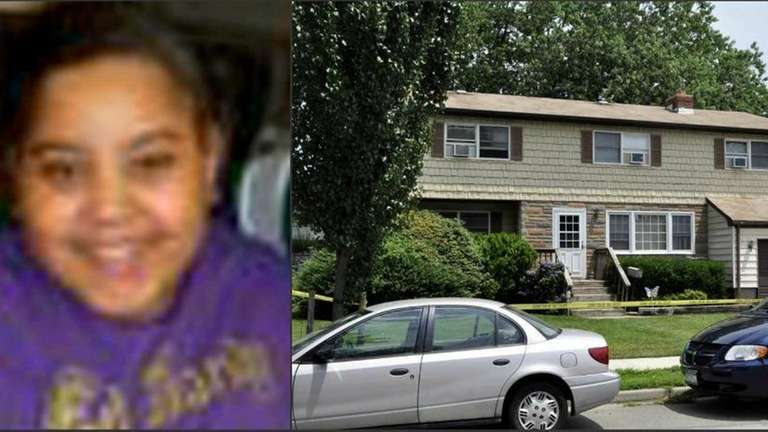 (July 23, 2011) Photo Credit: Handout / Peter Walden Sr.
A Plainview mother who wrote a note found with the body of her 8-year-old daughter saying she wanted to "give her back to heaven" admitted Thursday to killing the child who had cerebral palsy. Julie Cirella's death on July 23, 2011, came hours before she was going to be a flower girl in a family wedding. Under a plea deal reached in Nassau County Court, Veronica Cirella, 34, will now get a 12-year prison sentence for first-degree manslaughter. She had faced up to 25 years to life in prison if found guilty of second-degree murder. Authorities found the girl's body in her family's basement apartment, with her mother semiconscious nearby with a cord wrapped around her neck. Prosecutors said the note found at the scene was written in a way "that asserts an intention to kill." But the mother later asserted in a Newsday interview she'd "never ever" hurt her daughter, and was so grief-stricken when she found Julie dead that she swallowed pills and tried to strangle herself. In the note, the defendant wrote of domestic issues with her husband, saying she couldn't risk Julie being mistreated if something happened to herself. "I had to give her a better life, which was to give her back to heaven. She does not deserve any more pain whatsoever," she said in the note. Joseph Cirella, Veronica's husband and Julie's father, and Dolores Cirella, the child's paternal grandmother, were in court Thursday in Mineola to support the defendant. Dolores Cirella cried as her daughter-in-law pleaded guilty, later calling her "the best mother" who never complained about caring for the disabled child. "What happened, we don't know, nobody knows. She would never hurt her, she loved her," the Melville woman said, adding she believed her daughter-in-law pleaded guilty because it was "the better alternative." In court, the defendant first said "no" when Judge Philip Grella asked if she'd done something to cause Julie's death. But the defendant then admitted to the crime. She also said she'd undergone treatment for mental illness in 2004. Authorities alleged at first the mother tried to kill herself after not taking the right steps to save Julie after giving her M & M's -- knowing it could inflame the child's peanut allergy. But an autopsy found no peanut residue in the child's body, according to defense attorney William Keahon. He said the medical examiner decided the child died from an asthma attack, from choking on regurgitated food or from being smothered. The attorney also said Julie suffered from severe asthma and acid reflux. Prosecutors said last month they believed the mother killed her child by asphyxiating her, and added Thursday that the medical examiner found Julie died of asphyxiation but couldn't determine what caused it. Acting District Attorney Madeline Singas said in a statement that Julie's life "was cut tragically short by the one person who should have protected her." Keahon called his client a "fantastic mother" who had been dealing with problems with her husband -- against whom she had a stay-away order -- as she cared for a disabled girl in a wheelchair. Veronica and Joseph still are married, according to the family. "Sometimes you take a plea and in fact you're not guilty," the Hauppauge lawyer said. "But you take that plea because of the severe consequences of what could happen to you if you go to trial." Of the victim, Keahon said: "Julie would want her mom to continue with her life, be strong, get out as soon as possible, and get back to the family that loves her."